Boiled Rice is a dish made from rice as you might guess; how to make boiled rice is pretty similar to cooking rice with a regular pot. The difference is when making boiled rice we will add more water than when cooking rice. The timing to make boiled rice is similar to cooking rice also, or sometimes may be longer. 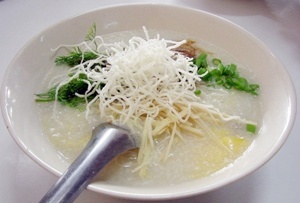 There are several types of boiled rice like plain boiled rice and boiled rice with pork. In some countries, people could use oat, wheat, barley or boil the rice in milk too. If cooking boiled rice for a long period of time it will become what we call “Joke”. Joke is a dish made from cooking rice and water until the rice becomes fine and there is no shape of the rice grain left. This dish (or variations) are popular in many Asian countries. Joke is eaten in some cultures as breakfast or dinner as the main course. Joke is able to be cooked in a regular pot or rice cooker. In some countries, it is considered that rice and Joke are the same foods. • Plain boiled rice is a plain white rice boiled and tasteless dish. Usually eaten with other dishes like salted egg, etc. • Boiled rice with pork is similar to plain boiled rice, but boiled rice with pork will have pork bones added to it, so that this kind of boiled rice typically tastes better. 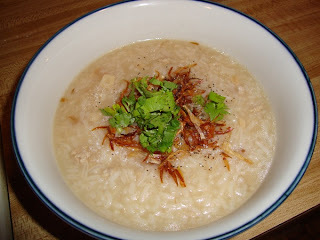 • Three kings boiled rice is a type invented by Rama V during his travels throughout Thailand. It is similar to how to make boiled rice with pork, but instead of adding pork we add mackerel, squid and shrimp into it. Today we will present you boiled rice with pork. It has ingredients and how to do as follows. 1. Place the pot with water and the pork bones in it over medium heat. Wait until the water starts to boil. If there is foam that starts to form on the surface please scoop it out. The foam will give your broth a bitter taste if you leave it in there. Then let it boil again for about 20 minutes. 2. Reduce the heat down to low heat. Add jasmine rice, follow with 2 Tbsp soy sauce and Knorr cube or Rod Dee (pork flavor). Let it simmer for about 15 minutes. Please stir from time to time otherwise the rice will be burnt and stuck on the bottom of pot. 3. While waiting for the rice to cook. Heat the oil on the pan over medium heat until it hot. Add sliced shallots to fry, when they turn amber yellow, put them aside on the paper towel to absorb the oil. 4. Use the remaining oil after frying the shallots to fry the garlic. Once the garlic starts to turn yellow add the minced pork and the remaining 1 Tbsp soy sauce. Stir fry until the minced pork turns dark brown and dry. Put the cooked ingredients into the boiled rice pot. Stir well, continue until the rice cooks well then and is tender (about 3-5 minutes) and then turn off the stove. 5. Put the boiled rice into a bowl, sprinkle with fried shallots, coriander, green onion, Thai celery, and ground black pepper. 6. Serve hot (this type of boiled rice, it should be eaten immediately after it’s done. If you wait too long the rice will become so sticky and absorb all the soup and it won’t be as tasty as it should be). Mix everything together well and taste, if not salty enough then add more soy sauce as you like.